Close-up of three raw turnips on a table. Turnips are top-shaped root vegetables from the mustard family. Raw turnips are spicy and crisp, whereas cooked turnips are sweet and soft and pair well with butter and savory spices. Cook turnips by boiling, steaming, roasting or microwaving. Mash cooked turnips like potatoes, mix them with other seasoned vegetables or blend them into a puree. 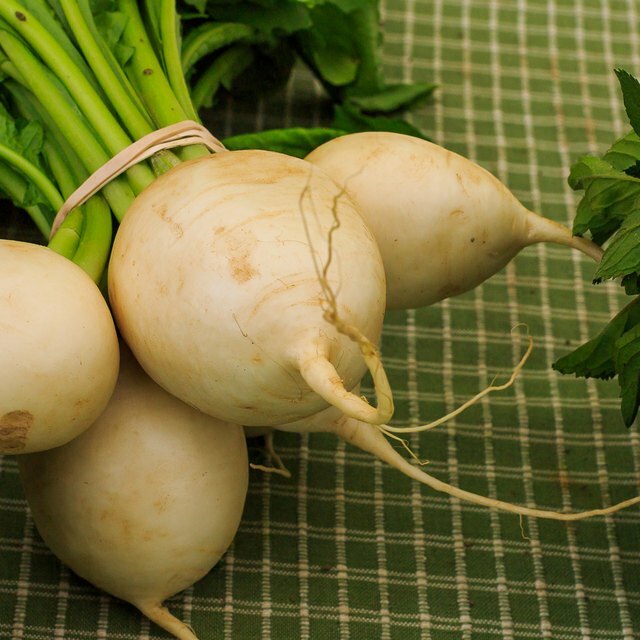 For the best results, purchase turnips in spring and fall when they are in season. Select firm, heavy turnips with smooth roots and some hairs hanging off the bottom. Scrub and rinse off dirt from your turnips before cooking. Use a paring knife to peel older turnips, but do not peel young turnips, which are smaller and have thin skin. Chop your turnips into wedges, cubes or matchsticks before you steam them. Eat young turnips raw if you prefer, but cook older turnips. Cook turnips using a steam basket in a pot of 1 to 2 inches of boiling water. Place them in a single layer in the basket for even steaming, and put a lid on the pot. Steam turnips until just tender; avoid overcooking because it diminishes the sweet flavor. Pierce your steamed turnips with a knife tip or skewer to gauge tenderness. Mash cooked turnips or serve them as you would potatoes. Reduce cooking time considerably by steaming smaller slices of turnips. Steam turnip match-sticks for seven to nine minutes or cook 1/2-inch cubes for 10 to 13 minutes. Medium turnip quarters take 17 to 20 minutes to steam, whereas medium-sized turnips take 35 to 45 minutes. Larger turnips may take even longer than 45 minutes. A 1/2-cup serving of cubed turnips is 20 calories and contains 2 g of dietary fiber and 1 g of protein. 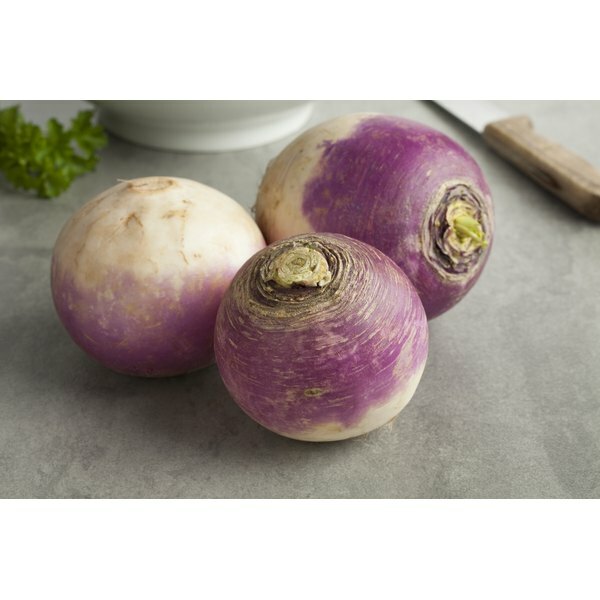 Turnips provide 15 percent of your daily intake of vitamin C and 2 percent of your daily calcium intake. Season turnips with spices and a small amount of butter or oil to add flavor without drastically increasing calories. Turnips go well with dried rosemary, thyme, basil, cinnamon, ground ginger or cumin. You can also enjoy turnips with lemon, parsley, nutmeg, garlic or spicy cheeses.